Honey is an organic, natural sweetener with no additives that is easy on the stomach, adapts to all cooking processes, and has an indefinite shelf-life. It is made by honey bees. Common and Other Names: bee nectar, honeycomb, honig, miel, miele, hunig. Honey Availability: Honey is readily available in jars, cans, and plastic containers at local grocery stores. Some specialty markets and roadside stands will sell fresh honey direct from local beekeepers. Honey Varieties and Forms: The various forms of honey include liquid, comb, cut-comb, solid (granulated or crystallized), and chunk. Varietal flavors are determined by floral source. Honey Storage: Honey has an indefinite shelf-life due to its high concentration of sugar. Keep honey away from direct sunlight in a tightly covered container. Honey may be frozen to retard granulation. Miscellaneous Honey Information: Honey is not recommended for babies under one year of age. Although honey is a natural, healthy food that normally cannot support bacterial life, it’s important to note that it can carry C. botulinum spores which may be harmful to the undeveloped immune systems of infants. It’s very easy to substitute honey for sugar in your recipes. 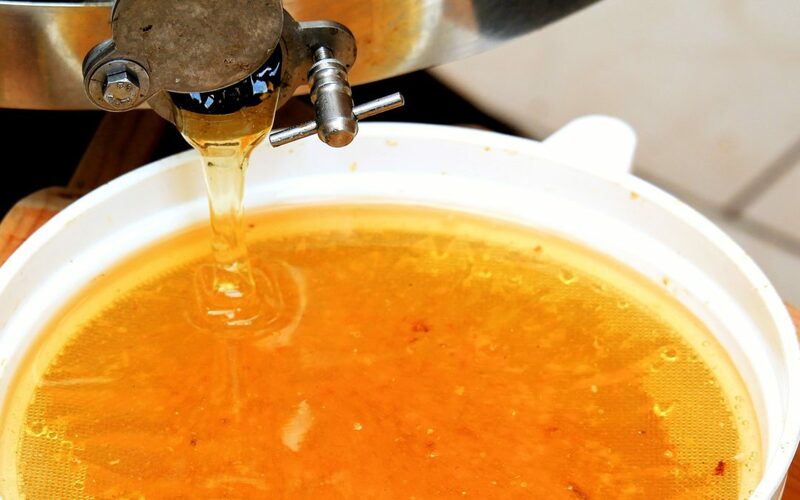 Honey is up to twice as sweet as table sugar, so you will need to reduce the amount called for in the recipe by one-third to one-half honey for granulated or table sugar. Also, since honey is composed of up to 18% water, you will need to reduce the liquid called for in baked goods by about one-fifth. When baking sweets, you should also lower your oven temperature by 25 degrees F. (15 degrees C.). To help accurately measure, know that a 12 ounce container of honey will equal a one-cup measure. And, to help that honey slide smoothly from your measuring utensils, simply lightly coat the utensil with a vegetable spray before measuring the honey. Unless the recipe calls for sour milk or cream, some cooks add the merest pinch of baking soda to the recipes of baked goods to counteract the slight acidity of the honey which may cause overbrowning. Since it has the ability to absorb and retain moisture, honey is used in the industry to keep baked goods moist and fresh. Use honey in baked goods you plan to mail to keep them bakery-fresh. Honey is also an excellent choice to use in salad dressings, since its emusifying qualities make it a perfect stabilizer. Honey is a natural energy restorer. Need a quick boost? Try a teaspoon of honey in warm water. This will not only restore your energy, but it will help your digestive track too! Honey is one of the earliest forms of saccharine substances known to man. The colors of honey comes from the nectar of the plants. The lightest colors of honey have the mildest flavors, while the darker colors have fuller flavors. Did you know honey bees must tap over two million flowers to make one pound of honey, flying a distance equal to more than three times around the world? The average worker bee will make only one-sixteenth of a teaspoon of honey during its lifetime. I know how hard it is to get the locust honey. Is that it for the year or will you have more for sale soon? I would like to purchase 6 bottles or whatever I can. Thank you! Thank you for inquiring about the Locust Honey. The season for Locust Blossom is coming upon us soon and here in the Midwest, the opportunity for foraging in a locust grove is very hit and miss. There is only about a two week window and it is very dependent on good weather. The Locust trees will flourish approximately every seven years. The Locust Blossom is very fragile and wind or rain can easily wash them away and the opportunity for the Honey Bees to collect the nectar from the this sweet blossom can vanish. Please keep watching our site or call the gift shop for updates on the availability.